Horizon Addis Tyre Share Company (HATSC) which already secured ISO 2008 Certificate for its Quality Management System received another ISO 14001 awards by applying Environmental Management System, which was conducted by external certification body ETA, Austria on June 2014. This proves that HATSC have a potential & capability to meet all major international standards by working hard. It’s also given leverage for our continuous improvement and reiterates the commitment to improve internal working atmosphere as well external environment. Protecting nature – the only way to secure better future!! 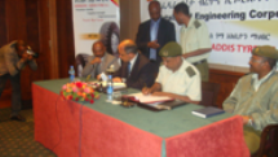 The memorandum of understanding was signed by and between the Metal & Engineering Corporation and the Horizon Addis Tyre S. C. The purpose of the memorandum of understanding is to use the locally produced tyre. Horizon Addis Tyre S.C. is committed to produce the tyre with required quantity, better quality & competitive price that will be used by the corporation as a substitute of imported tyres. The corporation’s Deputy General Manager also confirmed that they promise to use the domestic product subject it is produced in their specific requirement. 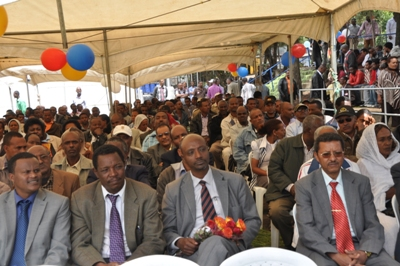 The employees of horizon Addis tyre s.c cerebrated their annual workers day. The workers put their statement through their representative that they are working hard to improve the productivity of the company and with out compromising to the quality of the products. They also promised to undertake their activities in a better cost effective manner. The women workers of horizon Addis tyre s.c participated on the women great run held in Addis Ababa. Recently, Horizon Addis Tyre S. C. highly diversified the type of tyres that it is manufacturing. In addition to the PC, LT and TB diagonal tyres that it was producing, it is now manufacturing PC and LT radial tyres, new HT series diagonal tyres of all categories, Forklift tyre, Farm tyre, OTR tyre, Three Wheeler (Bajaj) tyre and Flotation tyre.